"it seems like a really stripped down big muff" Yes, the Pharaoh Supreme w/ 2nd stage clipping and tone stack bypassed. BAT also made this as the no-knob Oath. 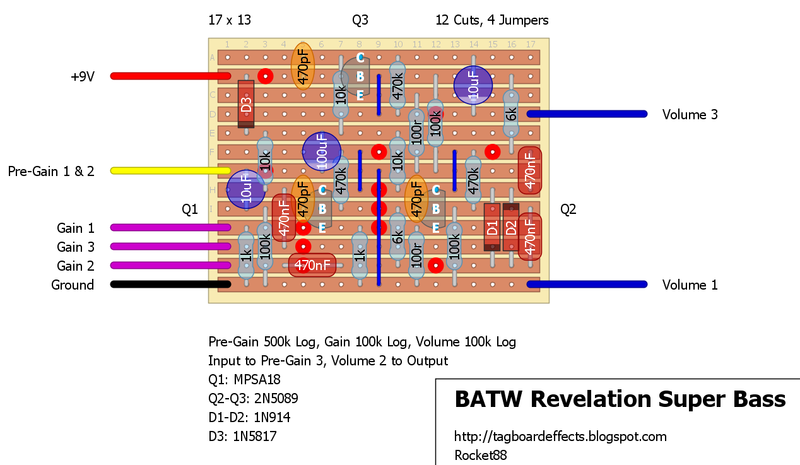 Am I right in thinking this could be achieved by taking input directly to where Pregain connected to the board, output where Volume 3 was, and replacing Gain with a jumper between the two 470nF caps? not sure. 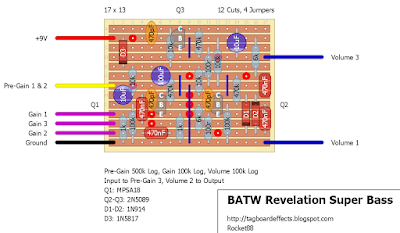 i took a look at the guts of the oath, and there's a single pot wired on the board. i didn't trace the original circuit so i don't know what the internal control is for. could be volume could be gain or pregain. ok. looking at that picture of the oath, and someone that tried to mod theirs to match the revelation superbass i think i figure out the values. posted a new layout for the oath. You can verify this. My gain pot was in reverse but that could be me. I built it in a hurry to be able to take it to a band practice today. Great work. I've been looking out for this for months. Built one of these but replaced the 2 100Ω emitter resistors with 560Ω to drop the gain as I found it was filthier than I need. I'd like to correct a mistake on this one: If you look at the Pharaoh this is based on, the input cap of 10uF is reversed. The input signal comes in at the - and the + goes to the bass of the transistor. according to the schematic it's the way i have it in the layout, same way i have it in the oath. with that said, i did think that was a mistake. i made the change to both layouts. cheers man. is there a different between 100k and 100r resistorts? yes. 100k resistors is 100 kilo-ohms, while 100r is 100 ohms. Hey I build this its great and pretty close to the original love the way it's LOUD and almost transparent. I found the treble get's a little rolled off. if there was a way to build a treble tone control into this it would be dynamite! I was thinking the same .the pedal is a little muffled sounding .I'd love to be able to add just a little more high end. Dude, it’s called the SUPER BASS, so of course there’s a lot of bass. I posted the layout for the SUPER LEAD version, which has more high end. You should be able to easily change one to the other.